Parents often ask us “What is the best backpack to buy for my child?” So we thought we’d give you some hints and tricks on what to look out for, AND most importantly how to carry the backpack in a spine safe way. It is important that parents of school aged children look at the quality and fit of their child’s backpack, as heavy, incorrectly fitted and badly packed school backpacks can lead to spinal health problems as your child grows. Spinal health is crucial at any age and items like heavy backpacks may cause strain and discomfort to the spine. We believe spinal pain can be attributed to a number of factors, and heavy and incorrectly worn bags may also lead to poor posture, slouching and uneven hips. The relationship between spinal health and carrying a heavy backpack may also depend on additional aspects such as your child’s age and weight. Make sure the backpack is the right size for your child, no wider than their chest or worn any lower than the hollow of their lower back. A moulded frame on the back, that when adjusted fits their spine. A bag made from a light weight material like canvas, with two padded straps. Adjustable waist and sternum straps. Separate compartments that allow for easy packing and weight distribution. Ensure that the weight of the backpack is no more than 10% of your child’s weight when packed. Only pack essentials to lessen the load, perhaps use school lockers if available. Pack the heaviest items closest to the spine and make sure all zippers are done up all the way. Secure the sternum and waist straps (they’re there for a reason). Always wear both straps. Tell the kids it’s not cool to ‘one-strap it’ anymore. Reduce the time spent wearing the backpack to no more than 30 minutes at any one time. 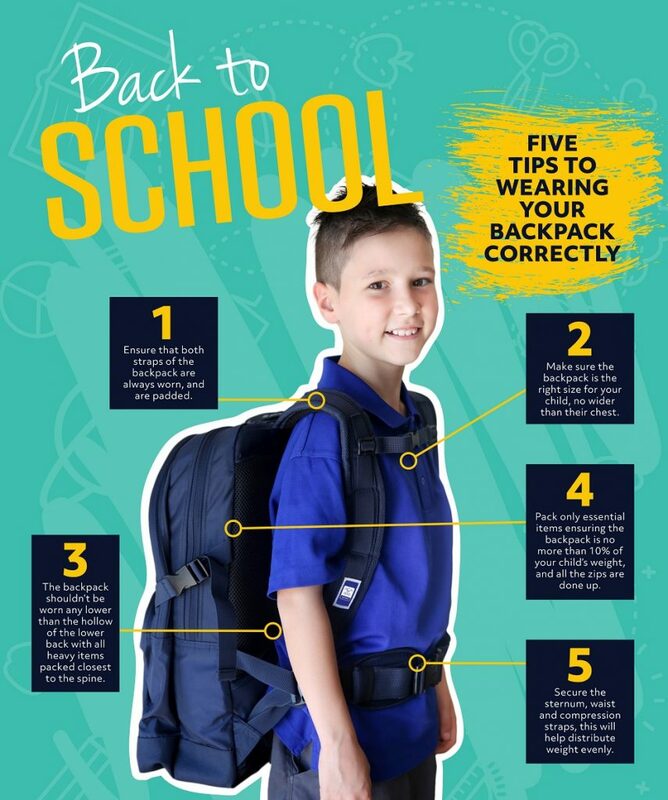 If you’re looking for a backpack that ticks all the boxes above, the Australian Chiropractors Association together with Spartan School Supplies developed the ‘Chiropak’. This durable, functional and comfortable backpack is designed to reduce the incidence and severity of neck and back pain associated with carrying heavy loads. We welcome you to make an appointment before school resumes for more advice and assistance on selecting the right backpack, making sure it is fitted correctly to suit your child’s current level of development.